Membership experience is what defines our members' time with NUSS. We strive to provide the most enjoyable experience to all who are part of the NUSS family. 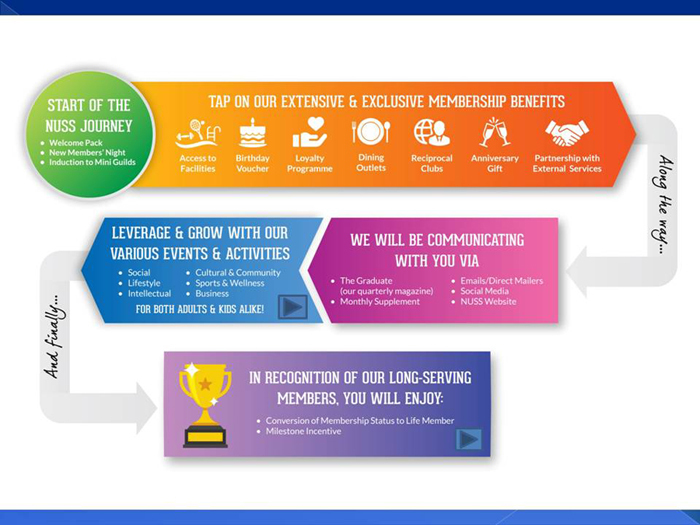 The following framework is snapshot of what members will enjoy at each stage of their journey with the Society. Through NUSS' meaningful and engaging initiatives, as well as continuous enhancement of membership benefits and privileges, we hope to continually satisfy and delight our members. For more information, please contact Ms Diyanah at diyanah@nuss.org.sg.